In only a week, an asteroid will strike the Earth, most likely killing everyone on the planet. Attempts to stop it have so far failed, and people have accepted that in approximately one week, the world will come to an end. Tumble & Fall follows three teenagers as they figure out what to do with the time that is left. I really loved the idea of this book–it’s a novel about the end of the world, but the focus is more on the characters and their final days, rather than the actual destruction of the world itself. The only problem I had was that I felt that there were too many narrators in this story. I liked the idea of the book following three teenagers, but at times it was confusing. When I first started reading the book I had trouble keeping track of whose family members were who, and even by the end of the story I felt like I kept mixing up characters a bit. The jump back and forth between the three main characters made it harder to connect with each character because I was focusing on trying to remember what had happened to that character when we last saw them and who each of the side characters in their stories were. I feel like this may have worked better with just two main characters–three just seemed one too many. Caden’s story was my least favorite, and every time his chapter came up I found myself sighing and resigning myself to power through his chapter until I got back to one of the other characters. After reading the entire book, I understand the message that his story sends and I do think it was important, but I did not like the execution of that message. Caden gets kidnapped by his father, who had left Caden, his mother, and sister when Caden was a child. His father is some super rich guy who wants Caden to spend the last week on Earth getting to know him. This whole thing was just weird to me–why did his father need to have him kidnapped by his cronies like in some mob movie? Since Caden grew up wondering where his father was, it’s possible that had his father asked to spend time with him, Caden would have consented. Also, the methods his father uses to try to “bond” with Caden were just bizarre, as was the whole issue with his father’s girlfriend Sophie. The whole plot of Caden’s story just seemed a bit contrived, so much so that I found myself extremely uninterested. On the other hand, I really loved Zan and Sienna’s stories. Zan had lost her boyfriend ten months earlier, and had been trying to recover from that loss. She finds a receipt in one of his old books that has a girl’s name and phone number, and it is dated the day he died. She becomes suspicious that he may have been cheating on her, and that this perfect person she had built up in her head may have not been so perfect. She embarks on a journey with her boyfriend’s best friend, Nick, to find this mysterious girl and discover the truth. Sienna had also suffered from a loss–her mother had recently died, leading Sienna to become severely depressed. Sienna had tried to kill herself, and ended up in a rehab facility for a few months to recover. Her father picks her up to bring her back to the island so that they can live out the last week as a family, but he breaks the news that he has met someone and they are getting married this week before the world ends. Sienna finds this hard to deal with, and when she meets a boy named Owen that she used to play with as a child, begins sneaking out of the house to be with him. I feel that both Sienna and Zan’s stories sent really great messages. Zan’s story teaches about the power of forgiveness and all of its forms, and Sienna’s sends a message about the importance of family and the many different types of love. Overall, Tumble & Fall was a good read with some powerful messages about family, forgiveness, and love, though the multiple narrators took a bit away from the story. I liked the way the book ended and how the stories all came together, but I did feel as if certain things were left unresolved. 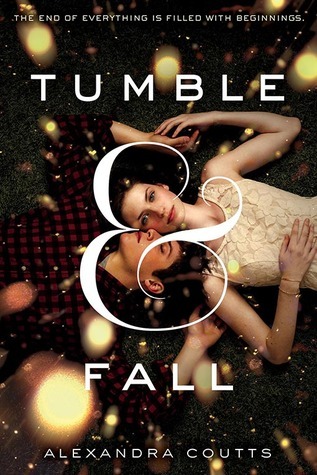 Tumble & Fall will be released on September 17, 2013.